Average mortgage rates tumbled on Friday, returning them close to where they were last Monday evening. They’re still well above their recent low, seen on Mar. 27, but significantly below where they were a month ago. Friday’s fall was unexpected. Some of it was probably down to that morning’s employment situation report. However, markets had barely reacted to that 90 minutes after publication. Later, President Trump urged the Federal Reserve to cut interest rates and reintroduce quantitative easing. 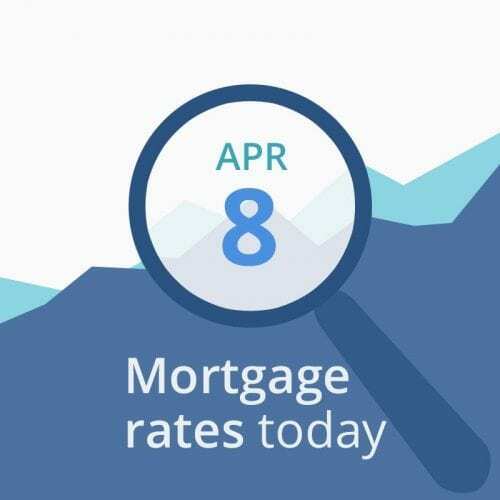 The data below the rate table are similar to Thursday’s and Friday’s: indicative of mortgage rates holding steady today, or possibly just inching either side of the neutral line. That held good on Thursday. However, Friday saw a sharp drop in those rates in spite of those early indicators. So please do bear in mind that these snapshots are only a guide. On some days, plenty can and does happen to change markets. Unless things change, mortgage rates could be in for a quieter day. Even though last week’s rises have been significant, they don’t yet constitute a trend. Those are impossible to discern from just a few days’ changes. Frustrating though it is, there really is no way of knowing immediately what movements over a brief period mean in their wider context. Last Wednesday, the House of Commons (the parliamentary chamber closest to our House of Representatives) passed by one vote a bill to force the administration to seek a further, longer extension and to prevent a no-deal Brexit. “No deal” would see the country crash out of the EU without any agreement. Nearly all economists and most businesspeople think that would be a monumental folly that would cause immeasurable economic self-harm. Wednesday’s bill isn’t yet law. It still has to win a majority in the House of Lords, which you could think of as a bit like our Senate. That majority is likely to already exist but it’s almost inevitable that opponents will do their best to block the legislation using procedural devices. Indeed, those tactics worked last week and thwarted attempts to rush through the bill in hours. Still, there’s a real probability it will be enacted today. Last Thursday, President Trump warned it might take four or more weeks to finalize an agreement, while hailing it as potentially “epic.” Certainly, both sides badly need a good outcome, and for similar reasons: First, to burnish political prestige domestically by bringing home a win. And secondly, to step back from economic slowdowns. The last big Fed announcement, which was doveish and ruled out further rate hikes this year, will likely add some downward pressure on mortgage rates in coming months. As we’ve seen in recent days, that doesn’t mean there aren’t other risks (currently known and unknown) that could see them rise, possibly sharply. And those recent rises create new grounds for caution. So we last week changed our advice. We now suggest that you lock if you’re less than 45 days from closing. Of course, financially conservative borrowers might want to lock immediately, regardless of when they’re due to close. On the other hand, risk takers might prefer to bide their time. Most other reports this week are less likely to create waves. However, any can, if it contains shockingly good or bad data. Today’s headline figure for factory orders was disappointing but exactly as forecast. So it’s unlikely that report will move markets much.